Vacant City Radio was featured on Patrick McGinley’s (aka murmer) soundscape/phonography radio show framework on April 19, 2009 as part of the framework:afield series, and can still be heard in the framework archives here. Along the rail lines and the waterways of the city the concrete hulks loom large and quiet; factories and silos that once clamoured with cacophonous machine activity, now laid to rest. These are hollow places: gutted, derelict, dusty, dark. In a city that fills with more people and cars every year, empty sheds or factories become liminal sonic spaces; their past an echo, their future demolition. 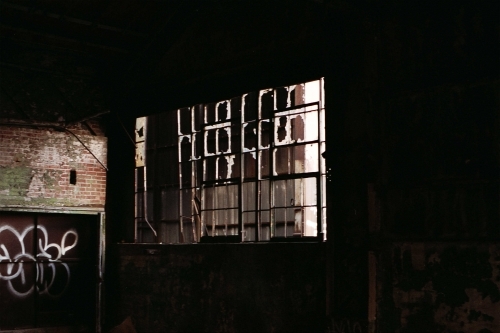 From 2001-2002 I recorded the soundscapes of abandoned factories and wharehouses along the Lachine Canal in Montréal. In the intervening years, all of these unique acoustic spaces are now lost – either demolished entirely or renovated into condominiums. I linked these field recordings touring specific empty places with more ethereal cities of radio and memory: the ‘lost’ cities on the shortwave dial. Many transistor radios, particularly from Europe, were designed with the names of cities in place of frequencies on the dial, but as shortwave broadcasting is in decline and as stations migrate to other positions on the dial, tuning to these frequencies often yields only static. I created compositions and performance pieces mingling these radiophonic and acoustic traces. Vacant City Radio explores vacancy and abandonment in the urban center, and the rare pause in activity surrounded by the otherwise churning urban soundscape. I am interested in these moments of transition between the monumental industrial past and the generic present, and the highly evocative nature of the sounds found in these empty buildings. Vacant City Radio considers ebbs in place and memory through ephemeral sonic and radiophonic representations of city, through lost sounds found in the dark halls of the factory and the radio dial. Vacant City Radio was developed during an artist residency at the Western Front, Vancouver in 2005. It first aired on ORF Kunstradio(Austria) on May 29, 2005. It has subsequently been featured on independent radio stations across Canada, as well as WKCR (New York City),free103point9 (Brooklyn), DeutschlandRadio Berlin, Ars Sonora, Spain, and others. A CD of this piece is available for sale through free103point9.org.